Nearly five years ago, my husband and I went on a cruise for our honeymoon. Cruises are notoriously famous for an overabundance of food, and I was more than happy to overindulge. One of my favorite cruise treats was the prosciutto wrapped cantaloupe that was served at nearly every buffet. I loved the sweet and savory flavor profile, as well as the textural contrast. I’d never had cantaloupe served that way before. This caprese recipe showcases the same play on flavors as the prosciutto wrapped cantaloupe that I enjoyed on the cruise. 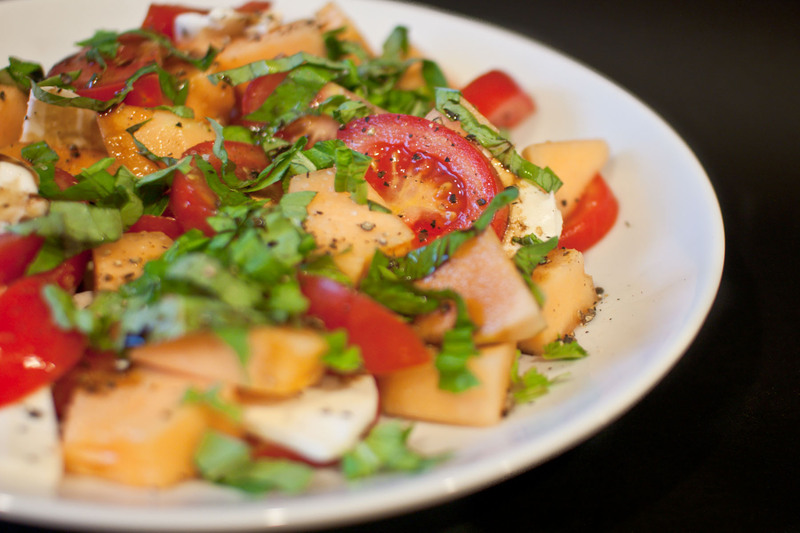 It’s a nice twist on the traditional caprese salad, and I think you’ll agree that the sweet melon is particularly good with the balsamic reduction. In a small saucepan over medium heat, bring balsamic vinegar to a slow boil and allow to reduce by half; about 5-7 minutes. Set aside to cool. Meanwhile, toss tomatoes, cantaloupe and mozzarella together on a large serving platter. Top with basil chiffonade, a drizzle of olive oil, a hefty pinch of coarse salt, a few grinds of freshly cracked pepper and a generous drizzle of balsamic reduction (use as much as you like — I ended up using a good 3 or 4 spoonfuls). prosciutto and melon is a traditional spanish tapas – so friggin good. the only thing that makes it better is balsamic reduction. you’ve capitalized well on the traditional and made something that looks just perfect for a light summer snack and/or starter. Yummers! (Did i just say yummers??? I hate that word). I think this looks fabulous! Another bookmarked. Don’t make friends with salad. But if you do, try this one. Oh, and this one too…not new, but one of my favs: watermelon, tomato, feta and basil. What a FANTASTIC idea! Pure Genius! Since I am a vegetarian I never tried prociutto wrapped melon, so I am super excited to try this spin off of it 🙂 I might even use a marinated tofu instead of the cheese! This looks fantastic. I haven’t had cantaloupe with balsamic, but I’ve had watermelon with it, and I really love the sweet and tangy crunch. 🙂 The colors are intoxicating, too. I love your addition of cantaloupe!!! Really adds a great flavor,I’m sure! I’ve seen recipes similar to this on Food Network and some travel shows but have never been inspired to make it. Now after finding this post and seeing the beautiful picture you featured I want to buy the ingredients and make this as soon as possible! The watermelon, tomato, feta and basil combo sounds fabulous too. Thanks for sharing! This looks SO refreshing. And oh my…those cruises are dangerous!!!!!! I know that first hand. I think I gained like 5 pounds when I went hahahaha.